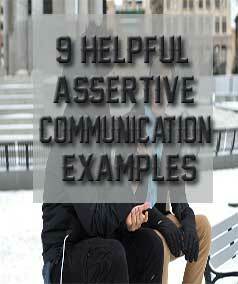 9 Helpful Assertive Communication Examples - Better Believe It! Assertiveness is the ability to honestly express your feelings, thoughts, beliefs, and attitudes while respecting the other person’s wants, needs, and feelings as well. Few people have perfect communication skills that they implement 100% of the time, and many people could brush up on their assertiveness communication skills. 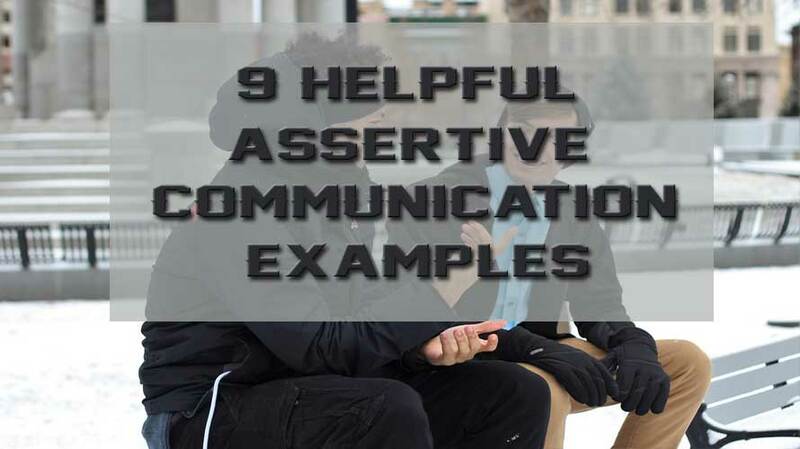 Here are 9 helpful assertive communication examples to help you improve your ability to stand up for yourself and communicate effectively. What Qualifies As Assertive Communication? You do so in a way that shows respect for the other person’s feelings, wants, or needs. Three of the other possible communication styles that you could opt for instead of assertiveness include passive statements and behavior, passive-aggressive communication, and aggressive communication. Passive communication is pretty self-explanatory. Passivity occurs when you don’t speak up for yourself, but instead choose to let the other person have their way while you don’t express what you want or need. Passive-aggressive communication is a way of communicating your needs, but in a round-about way. Passive-aggressive communication often uses sarcasm or humor. The person states their wants, but only by being sarcastic, making jokes, or by dropping hints about what they want. And finally, aggressive communicators strongly express their desires without taking the other’s person’s feelings, needs, or wants into consideration. Verbal abuse is aggressiveness, and so is communication designed to intimidate, frighten or make someone feel guilty. Why Does Being Assertive Matter? There are negative repercussions that occur when you don’t communicate assertively – some short-term and some long-term. Let’s say your friend wants you to come over to her house right away because she’s cleaning but her three kids are on her last nerve. You are currently in the middle of a household project of your own, and you feel as if you always do for this friend, but she rarely does anything for you. Let’s say you decide to take a passive stance. Once again, you drop the important project you’re working on to drive over and help her out. Initially, you may feel resentful and a bit angry at yourself and at your friend. Your self-esteem takes another hit as you berate yourself with thoughts like, “Why am I always the one who has to sacrifice? Why can’t I just be honest and say ‘No, not now’?”. Those are some of the possible short-term effects. But studies also show that those who repress their emotions, desires, and needs are more likely to suffer from depression, low self-esteem, loneliness, and even some physical disorders. If you take an aggressive stance, you might get angry and throw some items around the room or yell at your friend, or at someone else nearby. You might berate, belittle, or otherwise verbally abuse her. Of course, the immediate repercussions of aggressive behavior is that the other person becomes either angry, scared, or guilty. If you regularly engage in this behavior, you’ll probably find yourself alone since people do not want to tolerate such behavior. Prolonged, excessive outbursts that come from such aggression has also been indicated as a risk factor in heart disease. If you tend to use passive-aggressive strategies, you’re not really making your desires known. Maybe you state what you want then mask it by saying something like, “I was only joking. Can’t you take a joke?” In essence, you kind of hint at what you need, but you’re basically wanting the other person to guess what it is you want or need. 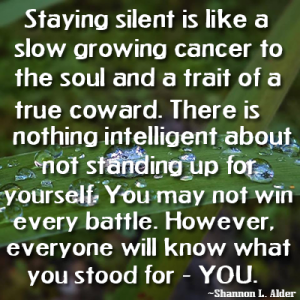 It’s an ineffective way to communicate, and you’re not standing up for yourself and being honest. Scenario: Your mother wants you to come over to her house right away so you can help her sort through items she wants to sell at a garage sale. You had planned to spend the evening relaxing, taking a soothing bath, and just lounging around because you’ve had a rough week at work. Part of being assertive is caring for yourself and valuing your needs just as much as the other person’s needs. An assertive person says, “I am worthy of this. I deserve this”. Scenario: You planned to meet up with your girlfriend to have a nice meal at a restaurant. You get there, but she’s late – again. Every time you make plans, she seems to leave you waiting while she shows up 20-30 minutes after the scheduled meeting time. Assertive people use “I” statements instead of hurling blame or insults at the other person. Offering to help come up with a solution lets the other person know that you care. Scenario: Every day when you come home from work, your husband and kids ignore you and continue doing whatever they’re doing. No one acknowledges you or ask you how your day was. Assertive people always state what the problem is instead of assuming that others know what they think, feel, or need. Scenario: Your teenage son is known to get angry every time you try to tell him to clean up his room or help out around the house. Sometimes we don’t express ourselves because we’re afraid of how the other person will react (Will he get angry? Will he not like me if I say this?). Assertive people understand that they have no responsibility for how the other person chooses to react – that’s on them. A normal human being will understand that we all have needs and desires and should be allowed to express them freely. Scenario: Your boss wants you to do your co-worker’s report because she has fallen behind schedule, and he knows you work efficiently. This has happened frequently. Stating the facts and expressing your own feelings helps avoid making the other person get their defenses up. Offering to help solve the problem expresses your concerns. Scenario: You work full-time, have 3 small kids at home, and you teach yoga classes two nights a week. Some members of your church are badgering you to get involved in a fundraiser they’re having that requires a lot of work. Assertive people know that it’s perfectly fine to say no to something you don’t want to do. Explaining why you’re declining may be helpful, but it’s not necessary. Acquiescing doesn’t do anybody any good. Scenario: Your brother-in-law asks to borrow $500 and you doubt he has a history of defaulting on his financial obligations. “My policy is to never lend money to friends or family members”. Using a “policy statement” is a good way to express your core beliefs and delineate what you will and won’t do. Scenario: Your spouse is yelling and complaining that you’re not devoting enough time and attention to the household. He launches into a long list of what he perceives to be your character flaws. Assertive people don’t get caught up in anger or strong emotions. They acknowledge the other person’s thoughts and feelings, but then honestly express their own as well. Scenario: Someone in the car you are riding in decides to sing offkey and continues doing it for 20 minutes. It begins to get on your nerves and you politely ask her to stop, but she doesn’t. Sometimes being assertive involves telling the other person the consequences of their actions. It’s alright to assert your needs and follow through with action that solidifies your own beliefs and desires. Being assertive is something everyone gets better at the more they practice. No one responds assertively 100% of the time. When we get angry, we might slip into an aggressive mode. When we find ourselves in a situation where we face authoritative people, we might slip into passive mode. Your goal should be to practice your assertiveness skills and bring them into your relationships more and more. Maybe you have no problem being assertive with your family, but you have trouble with it at work. The most important part of being assertive is taking the time to notice how you feel and realize that you have the right to be true to yourself and express your thoughts and desires honestly. No, Really. You’re Making It All Up. Click Here to Subscribe and get Exclusive Content! Get exclusive content not available elsewhere online.